I am currently a cofounder of Fero Labs, an automated machine learning platform for the industrial sector. In a previous life, I was an academic, and my somewhat outdated academic bio follows (written, of course, in the third person..). 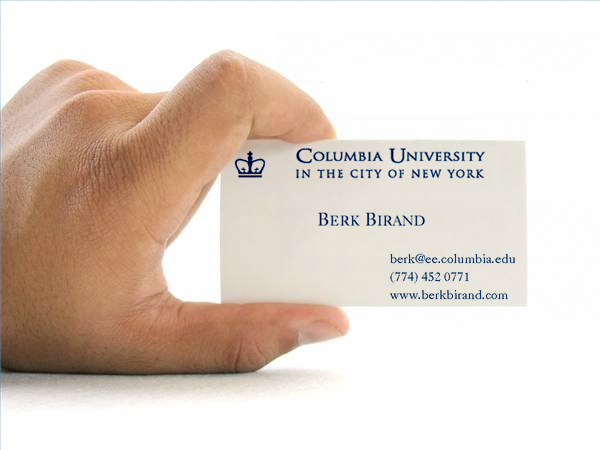 Berk recently finished his Ph.D. under the expert guidance of Prof. Gil Zussman. His research focus was on developing efficient cross-layer algorithms in wireless and optical networks. His latest work was on proving the performance bounds on distributed scheduling algorithms and on identifying energy-efficient resource allocation problems in optical access networks. He was an IBM PhD Fellow for the 2011-2012 academic year. His work on using graph theory to prove throughput-bounds on greedy scheduling algorithms was nominated for the “Best Paper Award” in INFOCOM’10. He was an invited speaker at the ACM S3 2010 workshop in Chicago, IL and received the “Best Theory Session Talk” award. He was the TPC co-chair of the ACM S3 2011 workshop in Las Vegas, NV. In Spring 2011, he was a Teaching Fellow for the Computer Science department. He was awarded the “Harold S. Black Award for outstanding EE senior” from WPI and the “Millman Award for outstanding EE TA of the year” from Columbia University. In the summer of 2010 and the fall of 2011, he was a research intern at IBM T.J. Watson Research Center, Hawthorne, NY. Some of the conferences he is interested in are listed here. His resume, contact information, and public PGP key are also available. Page generated 2014-08-05 14:25:29 EDT, by jemdoc.